The delegates rejected a ban on polar bear hunting because “hunting is not the most serious threat the polar bear faces” (recall that the bear was listed as endangered last year because of the pressures created by climate change and the consequent loss of icepack). Here’s a simple logical sequence: Hunting kills bears. If people stopped hunting them that would be one less thing killing bears. Unfortunately, this reasoning did not carry the day. Rather, opponents successfully argued that there is no point to killing fewer bears until we know for certain that we won’t kill them some other way. Follow this reasoning with me if you will. It is like refusing to treat your compound fracture until you’re certain that there exists a cure for your brain tumor. But there’s more. The bluefin tuna, which is being hunted into extinction by the world’s fishing fleet, will remain unprotected. 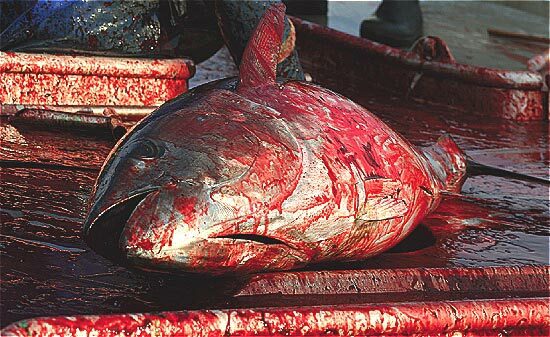 Japan led an effort to squash the proposed ban on bluefin hunting because it claimed that the catch should be regulated by the International Commission for the Conservation of Atlantic Tunas, or Iccat. Iccat has consistently failed to set quotas anywhere near what its own scientists say is necessary to preserve the species but, even if it did, the Commission would have absolutely no enforcement authority anyway. Even as they acknowledged that the species was in danger of extinction, the Japanese argued that Iccat should set catch limits that it had no authority to enforce and had never come close to advocating while the U.N. should do nothing. The international community agreed. The defeat of the proposed measure provided a huge victory for the Japanese delegation, who had lobbied delegates on Wednesday night with a reception featuring, you guessed it, lots of bluefin sushi. The delegates turn next to preserving sharks, which China – the largest consumer of shark fins in the world – has pledged to block. They will also consider a measure to protect elephants, in the face Tanzania and Zambia’s wish to resume trade in ivory. Any optimists left out there? Sometimes, I just want to move far away. Oh wait – I did. It didn’t help. If by optimist you mean “sadistically awaiting the painful demise (via metastatic cancers and mercury poisoning?) of our human species so the rest of the world can live in peace”, then yes, I am sadly still an optimist. News like this makes me want to move far away too. But where? Not Canada. Not Japan. Certainly not China. For once, the United States was on the right side of the tuna and polar bear issues. There really isn’t anyplace far enough away to avoid the problems. That solution hasn’t been viable since frontier days. The polar bear crisis seems like one that may not have a solution, as their resources and territories dwindle population pressures may be more deadly than hunters. You can’t pack more bears in a smaller space with good results. Bluefin tuna could be saved, but we’d have to stop eating tuna and stop fishing for them. We don’t usually do that until it’s not profitable. I have a bleak opinion on all of this and expect the world to go the way of Easter Island, where people ate everything to extinction that was more than a half inch across. Get ready for fast food made from worms and algae.